The crisp mornings that require a cozy sweater, sipping a pumpkin spice latte, and a walk through the fallen leaves are just a few of the things that I love about autumn. Then, there are the great books that beckon to call me to read. As much as I like snuggling up with an adult novel, I get even more pleasure sharing fall books for preschoolers with my favorite little ones. The list below has some newer fall releases as well as some classic autumn favorites. 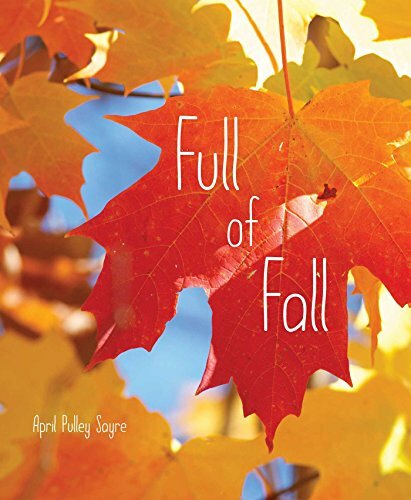 Full of Fall by April Pulley Sayre is full of beautiful fall photography and simple text. April seems to be setting herself up for a whole collection of books around the seasons. 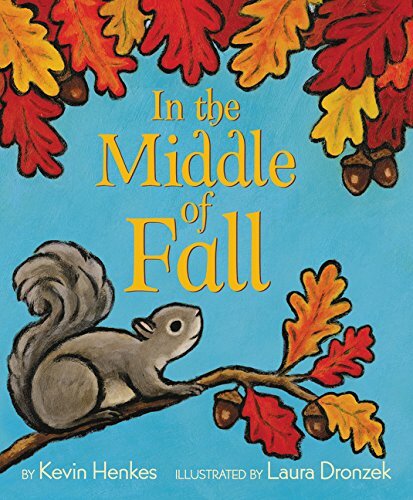 Beloved author of Kevin Henkes is back with In the Middle of Fall. Explore the tastes, sights, and sounds of the season in this book. Goodbye Summer, Hello Autumn by Kenard Pak offers a comparison and awareness of how one season transitions into another. Wonderfallby Micael Hall also takes us from one season to the next as we watch one tree go through a series of changes. There is also another layer to the book that explores the themes associated with the season. This one is packed with lots of discussion points with young children. There are just some books that are just gorgeous to read. The words are like music and fill your head with a vivid image. That sums up Yellow Time by Laura Stringer. This beautiful book is a must read for the season. Almost like magic, we begin to see things change in nature. Hocus Pocus, It’s Fall by Anne Sibley O’Brien shares magical moments in the environment that transform during the fall season. The fold-out pages bring an even bigger pop of fall color. Monica Wellington is one of my favorite authors for preschoolers. One of her newer books is My Leaf Book. It’s the perfect book to use after taking a nature walk and collecting leaves. Kids can use the book to help identify their specimens. And, check out Apple Farmer Annietoo. Giselle Shardlow from Kids Yoga Stories has a new book called Trish’s Fall Photography. It’s a fun look at fall and ideas for doing a little yoga too. The Busy Little Squirrel by Nancy Tafuri is one of my favorite preschool books. It will remind you a bit of Eric Carle’s The Very Busy Spider. Lois Ehlert has two treasures to celebrate fall. One is Red Leaf, Yellow Leafand the other is Leaf Man. The kids will be inspired to create their own leaf art after reading. A is for Autumn by Robert Maas takes us through the alphabet on a fall photography journey. Full of rhyme and perfect to sing as a chant is We’re Going on a Leaf Hunt. It was one of the books I featured on my We’re Going On A… Book List. Linda Glaser brings us It’s Fall. Beautiful language helps kids notice changes in the environment including the weather and animals. Leaf Jumpers by Carole Gerber would pair nicely with Wellington’s My Leaf Book. It’s another good one to use for leaf identification. Bear is puzzled by all the leaves on the ground. He tries unsuccessfully to put them back on the tree. After his winter nap, he discovers that there are new leaves on the trees. All of this happens in Leaves by David Ezra Stein. 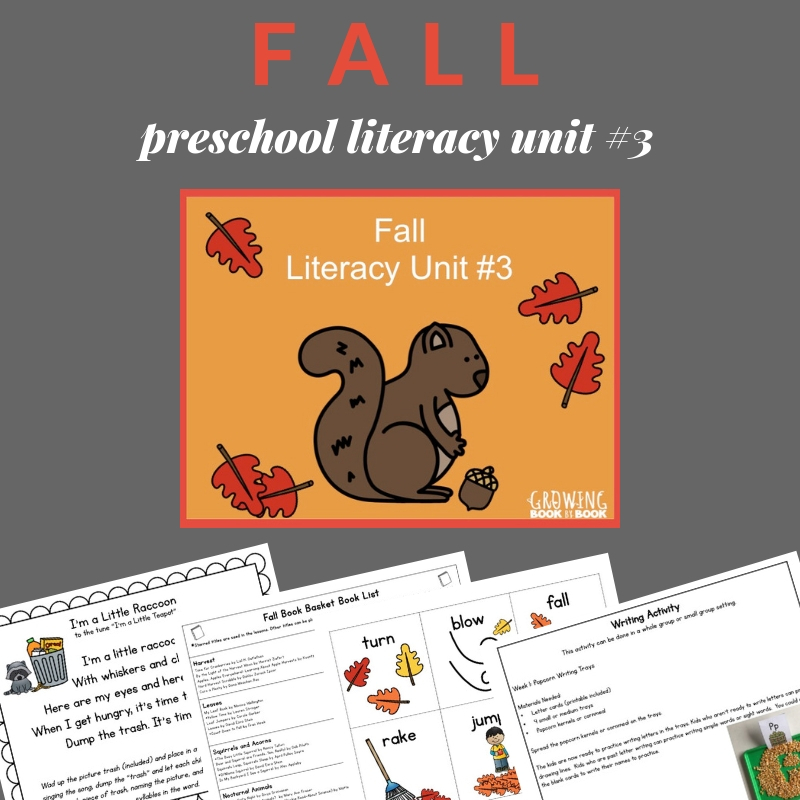 And, plan a whole fall preschool literacy unit with these ideas. *This post first appeared on Growing Book by Book 8/30/16. I am interested in thanksgiving themed books for preschool especially humorous books. I enjoY your book list. I request the books from your lIbrary especially seasonal books. Thanks. Great idea for a book list Shari! Great List! I’d add red Knit cap girl and the reading tree by naoko stoop as well. so cozy…. many thanks for all you do for my class. Thanks so much Marilyn. I’m in the process of creating printable lists for my book recommendations. It’s a timely process, but I hope to add more and more soon. Thank you Jodie! I have requested them all at the library. I appreciate your work on seeking out the new releases each month. I’m glad to help Susan. I hope you love reading the books!